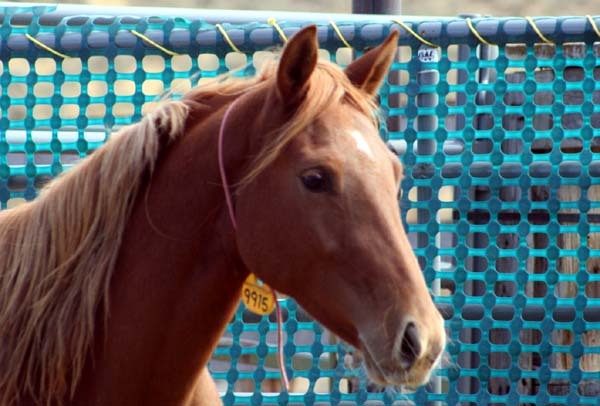 Right now there are about 375 mustangs in the pens in Burns Oregon, all available for adoption. This Chestnut filly is two years old and has been there since December of 2009. I don’t know how old she was when the photos were taken. What I do know is, if I had the time, the money and the space I would take her home with me in an instant, her and too many others… These are phenomenal horses. Regardless of how wonderful they are though, there is only one of me, and I have only the same twenty-four hours a day as everyone else. So here I am, working my way into a project I hope will make the most of my daily hours. 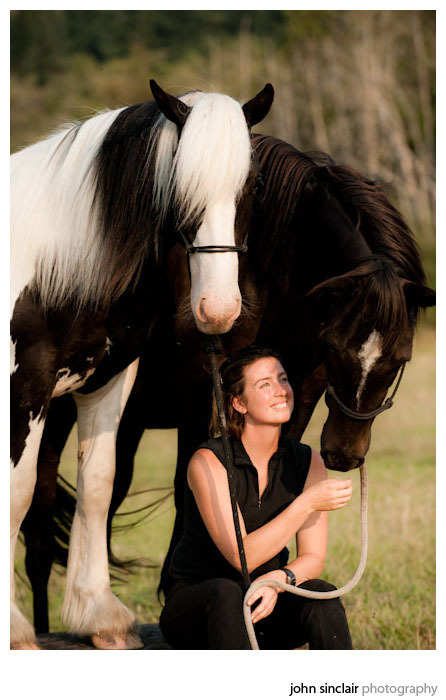 While I cannot adopt all the horses in the world, perhaps I can inspire people to connect with them in ever more enjoyable and satisfying ways. Horses cause me to grin like nothing else I know. My time with them each day lightens whatever weight the rest of life has laid on my shoulders. If I can facilitate that connection for anyone else, I feel my time has been well spent. Perhaps this mustang project is a piece of my expression, my vitality, my addition to the world. Beautiful words aside, the practicality of this project is starting to come into focus. Challenges and reservations are coming to the surface to be considered. I find myself wondering how I ever thought bringing yet another horse into my life was a good idea. My foremost partner is my Mustang mare, Saavedra. My two-year-old Mustang, Antheia, is my up-and-coming, brilliant, school horse… She has the perfect temperament to educate people with grace and fun; however, she is still just a youngster and will be my partner for a long time to come before she is expected to take on a teaching role. My two-year-old, Gypsy gelding, Lir, is just passing through my life learning how to pull a cart with me and learning how to play all those games people like to play. He is for sale, though so lovely to work with I can’t help hoping he doesn’t sell too soon. 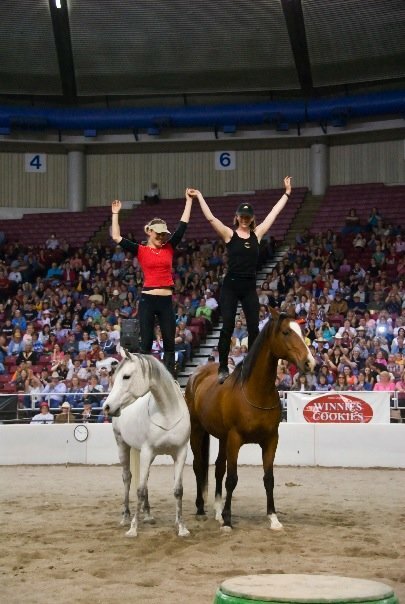 My mother and I maintain a teaching program with the help of six wonderful Arabian horses. My daughter has an Arabian mare, my mother has two Warmblood geldings, and then we have six more horses who come with their riders, back to our pastures in the summer bringing our numbers up to eighteen- well, twenty when you count the two retired geldings also. I feel compelled by this idea, inspired by this project. I can’t wait to turn the page and see what happens next. Then the numbers give me pause: twenty horses is a large number, am I insane to add yet another horse? These are not just horses, these are my family. How big does my family need to get? I considered letting Antheia fill the role of my project mustang, suspending her training with ropes and sticks and halters and letting her learn only in complete freedom for the next year. It would be easier to work with a horse to whom I am already committed, and yet somehow that doesn’t seem like the project I set out to do. The challenge I was interested in was a horse untouched by human training, a horse who could start at the beginning with me- a beginning without any tools of dominance. I spoke on the phone this week with Tara at the Burns, Oregon Bureau of Land Management facility. At this point they do not have any funding for gathering new mustangs. If funding comes through, the herd areas of Three Fingers and Jackies Butte will be brought in, most likely in August. Then it will be four to six weeks before those horses are available for adoption. I find myself thinking… if the horse I am adopting for this project has been in the paddocks for six weeks, it isn’t exactly fresh off the range anymore. That changes the feel of the project, though it looks as though there is nothing I can do about that. I would like to have a horse with as little previous contact with humans as possible, yet still at least three years old so that riding can be part of our experimental training year together. The next consideration would be male or female: A stallion will be hard to keep in the natural setting of a herd, I certainly do not want to breed any more horses at this point. A horse recently gelded seems a rough start to trusting humans. So that rules out the boys. A mare will most likely be pregnant if she is directly off the range. If I am questioning adding one horse to my family, I really don’t need a two-for-one deal. I don’t know though, is that just a risk I have to take to do this project from the fresh start I had in mind? Scenario one: I pick a mare from the horses that have been in the pens long enough to know she isn’t pregnant. She is more adapted to people than I had hoped, yet, she is physically the best horse for the project. Scenario two: I pick a mare fresh off the range. She may be pregnant, she may not be. If she is, that will be an interesting twist to the end of our year-long project. I am not sure what to do. Perhaps I just need to go down to Burns and see if there is a horse who calls to me- see which horse wants to work new ideas with me. Regardless of whom I choose, this most likely isn’t the last dilemma I will face in this project. Highs and lows, questions and decisions, come what may this project calls me forward. This video is so simple and beautiful a demo of building the skills for delayed gratification. Last week I talked about teaching a horse to become less independent, and more community oriented. I think learning to delay gratification is a huge part of being community oriented. So the question at hand is: how do we make that process as fun for a horse as it is for this squirrel? I walk this line every day, and every day I question my right to travel on one side or the other. The extreme of independent thinking- I want what I want, when I want it. Joy needs no justification. The extreme of community thinking- Is everyone happy? What can I do to make everyone happier? However, the two extremes can only exist together. A happy community is made up of happy individuals. We serve our community by taking care of ourselves, hopefully in a way that is in balance with a thriving community. I live in a community of horses. Some days the push and pull of community versus individual seems brutal and difficult to balance. Just like anyone, horses want to feel safe and comfortable and happy. Left to their own individual choices, that would include a herd life with plenty of food and water and wide open spaces where they could see the world and know they were safe from predators. They would enjoy interaction with others, maintaining their freedom of choice to walk away when they didn’t feel like playing. Horses, however, live in a state of slavery to people. There are too many of them to run wild and do as they please. If people are going to spend their resources feeding and caring for horses, horses need to, in turn, become community minded about the world of people. Yesterday I taught a two-year-old Gypsy colt to pull a travois of poles in preparation for pulling a cart; I taught a two-year-old Gypsian colt to be comfortable and relaxed having his ears clipped; I taught a two-year-old Mustang filly how to trot alongside my car to travel from one pasture to another. Thanks to halters and ropes I was able to progress these horses through the learning process of their challenges with incredible efficiency. Any one of those three youngsters would have preferred to graze on the lawn and just be easy and relaxed in my company. They would have enjoyed playing with small challenges I gave them, so long as the rewards were sufficiently matched to the degree of difficulty. That would be a fun balance between their individual desires and the natural desire to interact in community. People, though, always want more. So I find myself forever pushed to push the horses out of their individual mind set and into being more and more community minded. If they can learn the habits of being easy and soft and willing to do whatever is asked of them, there is a better chance they will be taken care of. The better they are taken care of, the happier and safer they will feel. I can logically justify the training I do as a good thing. I can use pressure and release to cause horses to learn to take care of themselves in a community-minded way throughout whatever challenges might come up, sharing their lives with people. Every day though, it kills me a little to see how horses are kept, even horses that work hard to be community minded and are lovely and easy to work with. They are locked in small stalls where they can’t move around, or kept in paddocks with mud up to their ankles, or they are kept in dry gravel paddocks with nothing soft to lie down on. They are kept in isolation, or in groups in spaces not large enough to get away from bad tempered horses. This morning I watched a video of something different: horses being cared for like horses might choose to be cared for, the horse’s individual nature valued more in balance with human’s needs for them to perform, 320 acres to roam, family, stability, security, and people to play with in a fun relaxed environment. I wish I could give that kind of life to my horses… Someday perhaps…for now, though, in an effort to keep everyone fed, and the quality of life as high as possible here and now, we will continue to walk the middle road: letting horses teach humans and humans teach horses, riding with halters instead of bits, using stiff sticks instead of stinging whips, endeavoring to use psychology instead of force. Someday, perhaps, we will lose the halters and sticks too and still be able to satisfy people’s individual desires in community with horses. I understand both sides of the equation- I am human and I too always want more. I dream of jumping four-foot fences and galloping cross-country, doing piaffe and passage and intricate obstacle courses at speed. I wrestle with my sense of justice to the horse. How much pressure would it take to get us to that level of skill together. Is that pressure justified? Or selfish? So I will continue to weigh the balance between what I personally want, and what my community of horses might like. I will continue to weigh the cost of living for our herd and what kind of pressure they need to gracefully accept in order to earn their keep. This project with the new mustang in August is an experiment of balance between the horse’s individual desires and mine. No tools: only the pressure the horse and I can put on each other, individual to individual in an attempt to build community together. If we can bond our individualism into community, what then can we do together, the horse choosing to engage in the tasks in equality with the rider? This blog entry is a musing stream of thought. I don’t claim to have the answers here, just a desire to find some. In the last few weeks I have been putting a lot of thought into the why behind aggression in horses. We can be continually grateful that horses are prey animals, not predators. For the most part they are gentle creatures and we can easily lose sight of how intensely powerful they truly are. Drafts have been bred for generations to be docile and easygoing; ponies can be hellions, but they are still prey animals, and small enough that people can usually manage them one way or another. When we see a horse angry with ears pinned, nostrils flared, teeth or hooves at the ready… I find human response falls into a couple of categories. One response I see is to ignore it, saying things like: the horse is just in a bad mood, woke up on the wrong side of the bed, he is just being a jerk, or he doesn’t really mean it. The other response I see, makes statements like: he is being a punk, knock some respect back into him. He is looking for a leader, show him who’s boss. Don’t let him get away with that kind of a bad attitude. I want to look a little deeper here. Why or how does a horse decide offensive aggression is the right answer in the first place? I think we can start with the premise that horses, like people, just want to feel good. What if aggression is a habit created as a coping mechanism, when life felt too horrible to tolerate and the horse knew no other way to feel better? What if, in desperation, in that moment he got threatening or struck out, and things got better, even just a little. Wouldn’t it make sense that next time he was in a similar situation he would try it again? Pretty soon, with enough repetitions you have a habit- a broad spectrum solution to be applied any time life feels confusing with no way out. Let’s face it, horses live through a lot of situations with no way out. They don’t get to choose when, where or how they are ridden, they don’t get to choose where they live or who their pasture mates are. If they have ever been hurt mentally, emotionally or physically, they become hyper vigilant about trying to make things better before anyone makes them feel worse. If aggression is the only tool they know how to use, can we really hold it against them? So let’s say we have a horse for whom aggression is the only tool they trust to keep their life in control. Let’s look a little closer at what a horse needs before we blame him for his aggression. A horse, first and foremost, needs to feel safe. Safety for a horse instinctually means he needs a herd with a hierarchy.- a leader who will get the herd to food and water, and herd mates who all care about and look out for each other. Leadership comes in all varieties and styles. A brilliant leader uses attention, focus and timing to communicate with the herd, instead of brute force. What if no one in the herd has those skills? The herd still needs a leader, somebody has to come up with some way to move horses around, and keep everyone working together. Aggression seems to become a viable tool at that point. Safety lies in having a herd. A herd needs to pay attention to each other. If there is not attention and focus to create that sense of safety… then perhaps aggression needs to step in as a coping mechanism. So let’s imagine we have a horse who feels attached to his habit of aggression to feel safe. 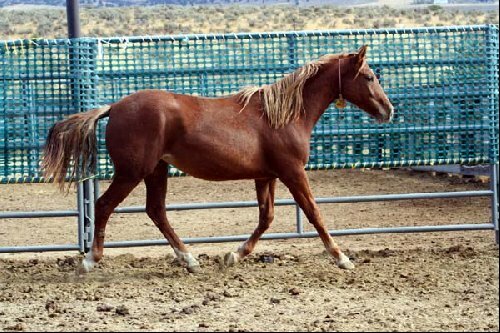 If we ignore it, I wonder if this leaves this horse feeling the lack of attention and acknowledgment as a loss of herd, and therefore safety, making them even more desperate to use the only tool they know of…. Aggression. Then we look at the flip side. We use aggression to counter aggression- make it clear that that attitude is unacceptable. Now I have seen this work on the surface. The horse feels better because he has gotten the attention he needed to feel safe and part of a herd. Unfortunately, I think it also reinforces the horse’s idea that aggression is the tool of choice to use when feeling insecure or unsafe. What if we can take a middle road? 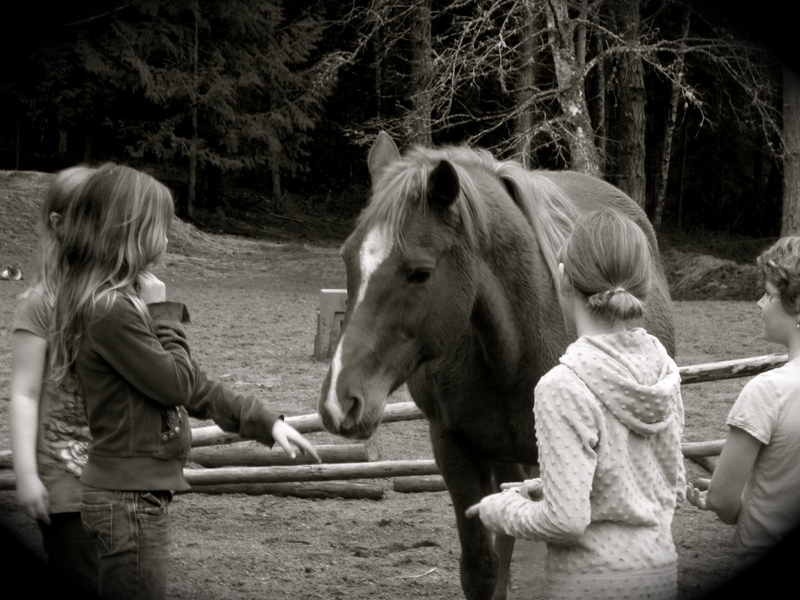 What if we were to take the time to pay attention to a degree the horse feels safe in partnership with us; take the time to show the horse attention and yielding are tools they can use to cause the herd to attract to them, pay attention to them, and make them feel safe. I like the idea… but the question remains: are horses any more willing to embrace change and new ways of living than we are as people. Might we really be able to cause a horse to learn new ways of interacting with the world? I think it is a question worth asking. I would like to live around horses who understand attention, yielding, and draw as tools- far more pleasant tools than aggression to define family and a sense of safety. Ransom was dapple grey, leggy and lean. Ransom was my first Thoroughbred. As with most of the horses in my life, I didn’t choose him with any forethought; circumstances simply arranged themselves in such a way as to bring the two of us together for a time. To this day I cannot believe my good fortune to have had him as a partner and teacher. Ransom started his life as a racehorse. As a racehorse he was well bred, well cared for, and well loved. 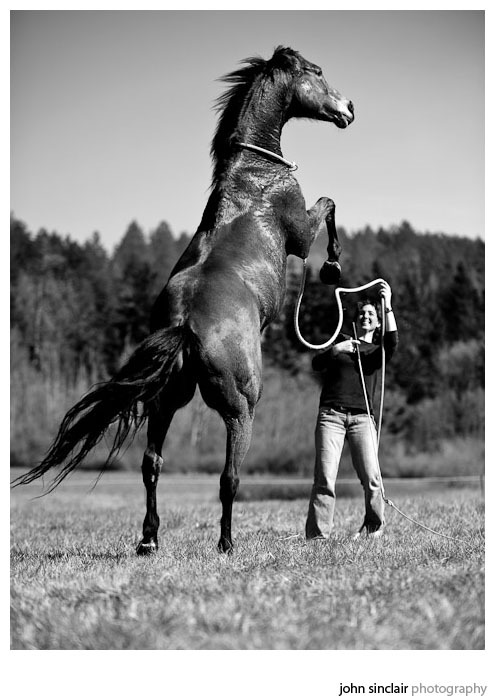 When a bowed tendon made it clear he was ready to be retired from the world of racing, my dear friend Rikke stepped in to bring him through his life change. I will admit, I was jealous. Thoroughbreds are such sleek powerhouses of grace and speed. All through my childhood filled with adorable chubby ponies, I would gaze longingly after the riders sitting high atop their long-legged, elegant, thin-skinned, hot-tempered horses. “Fritz and Beautiful Horses” was a story I always felt close to growing up. 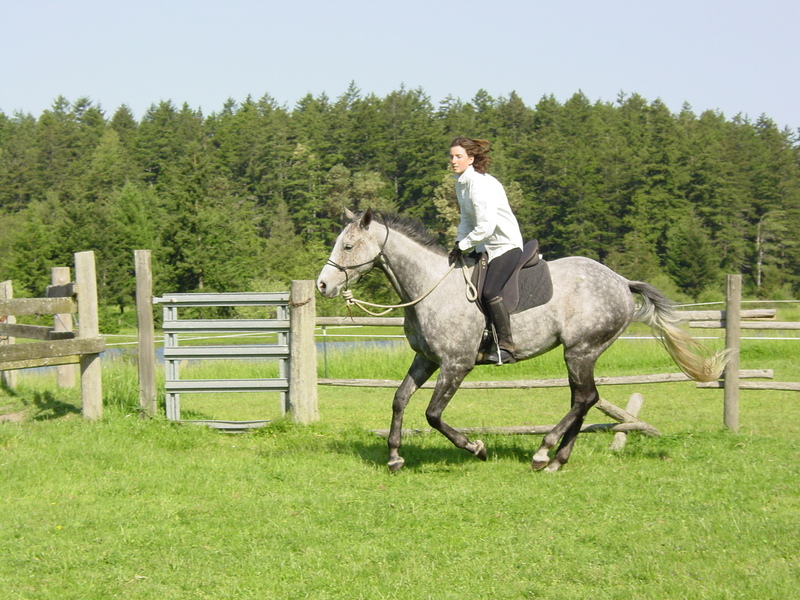 Here I was twenty- two years old, graduated beyond my fuzzy ponies and now riding my beautiful Warmblood cross, Zohari, elegant and long-legged too in his own way. The lure of the Thoroughbred still sung through me though, a desire not to be quelled. So when my friend Rikke found herself needing to move back to her home country of Denmark, and Ransom needed a new home, I was beyond thrilled to be that home for him. I think the greatest thing Ransom showed me was a style of herd leadership I had never observed before. He was a leader in our herd, and gained that leadership in a way that is still to this day a huge inspiration to me. Ransom was not a kicker or a biter. He did not seem to need disciplinary action as any part of his dominance. His dominant role in the herd was in part thanks to his intensely vibrant personality: watching him arch his neck and float across the ground to meet someone new was awe inspiring. It was also due in part to his phenomenal persistence in winning over his herd mates. We had a black Arabian mare named Shameeka who was not impressed with Ransom’s winning personality. When Ransom would waltz over to see her, she would pin her ears and walk away, not in the least impressed with his overtures of friendship. Ransom was not daunted, he just followed her, ears pricked, attention focused. She would sometimes squeal and kick at him, and he would just move slightly out of range and then follow again. Eventually she would become curious: what was he still doing there tagging along behind her, ever present regardless of her antics. As Shameeka would turn to look at him he would look away nonchalantly and wander off. She would lose interest, go back to grazing and he would snap back to attention, following her ceaselessly until her curiosity was piqued again. It took him three days of persistence wherein, little by little, Shameeka became more and more interested. By the end of those three days she was completely devoted and followed him everywhere. It blew my mind to see one horse win over another with so little violence. It also made me realize, while we talk about natural horsemanship and learning to understand and communicate the way horses do, there is a broad spectrum of skill in communication via horse language, just as there is via human language. Ransom was a master of positive communication. Outside of his herd skills, he also had a self-awareness in movement that was sensational. He could canter like a rocking horse, or stretch out and gallop with speed that took my breath away. Everything he did, you felt as though he had thought about it and decided it was indeed what he wanted to do. When I would shake the rope at him to back up, he learned that he could back up a few steps then take the rope in his mouth and shake it back at me. Turn about is fair play after all. I would laugh so hard and back away just as he asked. Working with Ransom was the best laughter therapy. For all the things I thought to teach him, he was right there with me to show me things I had never thought of along the way. Polocrosse was Ransom’s game. He was unbelievable. 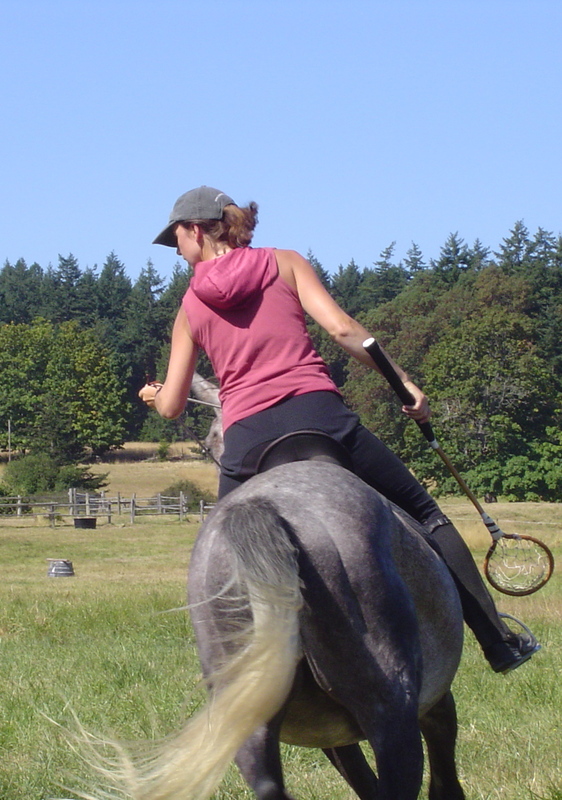 At our barn we play polocrosse with only a string around the base of the neck to guide them. That way you really get a sense of how much your horse wants to play the game. Ransom thought galloping and turning and jostling for the ball among six horses was great fun. However he had little patience for my lack of ball skills. We would canter up past a ball on the ground and I would miss the pick up. Ransom didn’t have to be told a thing; he would wheel around and place me right on top of the ball again. More often than not, I would miss again and Ransom would spin about to give me another chance. Chances were not unlimited though. At some point, if I missed the ball to a degree he thought unseemly, he would put on the brakes, screech to a halt, and turn to look me in the eye as if to say: If you don’t pick up the dang ball, we can’t gallop to the other side of the field, so pick it up already! Ransom was a horse that made me laugh, everyday. Unfortunately, he is no longer with us. In 2006 I moved to Norway for family reasons and Ransom became partners with my good friend Jenny. 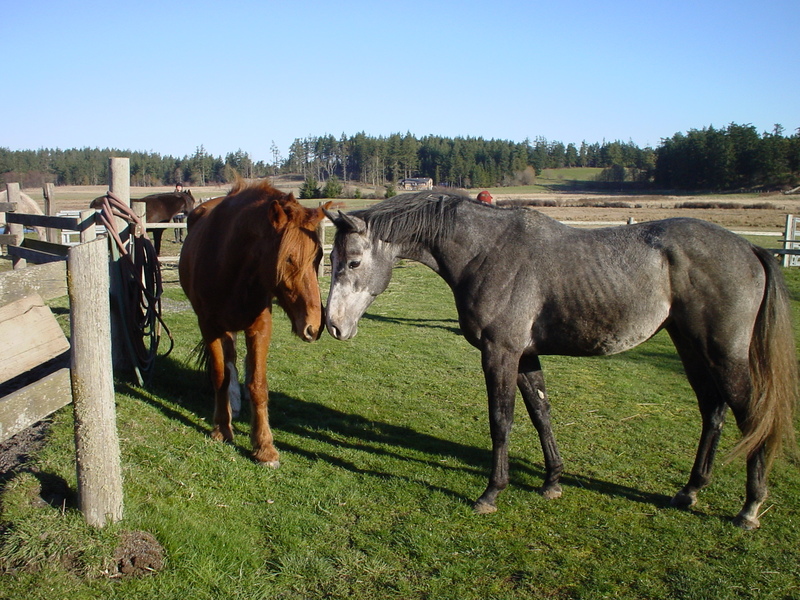 The two of them lived, laughed and rode together for a year, and then in a fluke accident one snowy day in the pasture, Ransom broke his leg and had to be put to sleep. He is missed by many, though I would like to think his legacy lives on in all he taught us. He was an inspiration to me in so many ways and I hope I can bring his sense of joy to the art of leadership as I befriend horses throughout the rest of my life. Thank you Ransom. You gave me an immeasurable gift.